Thread: Nosgoth Open Beta Begins - Play Now! Nosgothâ€™s Open Beta has officially started. This marks a huge milestone for Nosgoth as the game is now available for all users to play, for free, right here on Steam! For this first weekâ€™s celebration, everyone that plays will receive double XP on all matches played, giving you even more reason to jump right into the action. This double XP will end at midnight (PST) on January 28th (3am EST / 8am GMT / 9am GMT â€“ January 29th). You'll find a few new game packs that have launched today on the website and in the game, too. They're a great way to unlock extra in-game content in one go, and support Nosgoth's development in the process. We'll run through those in more detail in another blog soon. 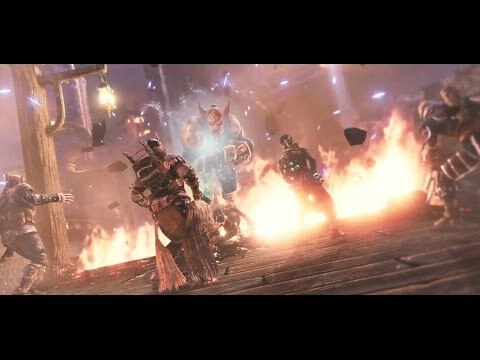 With our Open Beta launch we can now finally share an extra special trailer we've been working on, focusing on real gameplay, real Nosgoth fans, and using our in-game camera tool (NosCam). To create this top secret trailer, we drafted in some community members to join us for some play sessions. A big thank you goes out to them all again. Weâ€™re so proud of our dedicated and passionate community, we think this trailer is a great way to shine a spotlight on you guys! Donâ€™t forget, we will be streaming a live session on our Twitch channel from Psyonixâ€™s studios in San Diego, California, on Friday - 23rd of January 2015. Weâ€™ll be talking about the journey so far, taking questions from the chat, showing off our upcoming Vampire class (the Summoner), revealing the next Human class that is currently in development, and more! Full details are in the blog, tune in at 11.30am PST / 2.30pm EST / 7.30 pm GMT / 8.30pm CET on Friday 23rd of January 2015. All that remains now is to extend a huge thank you. The team at Psyonix have put together an Open Letter addressed to our community, because we wouldnâ€™t be here without you, and weâ€™re so excited to share this journey with you all. Now, I think itâ€™s about high time we all jump into a Nosgoth match, donâ€™t you? See you in-game! Is this a bug on the chart that the player count is exactly at the same number for an hour or is there some kind of limit? Just worried if things are alright. I ran into one of the older "party server unavailable" bug. Restart fixed it. Steamcharts doesn't always update, so I wouldn't take much notice of that. I've seen it freeze on various games for a while, it's not real-time. Squash the last few party and connection bugs and Nosgoth has a bright future! Not sure where to put this and haven't seen it elsewhere. Now that the game is in Open Beta, can we stream and/or record our sessions for out Twitch and YouTube channels? No NDA since a long time. FIRE AWAY!